The boat building industry has come a long way since the days of handmade wooden boats. Today, new knowledge and technology have unleashed a storm of new small boat building techniques devoted to better buoyancy, impact resistance, and speed. So what's behind the new trends? Better manufacturing technology as well as new construction techniques have addressed old issues and turned out a fleet of better boats. While some companies with new technology have recently come on the scene, others have been in the business for a while and have just modified their process. One of the industry's biggest trends is building smaller boats using a closed-molded and computer-controlled process known as Virtual Engineered Composites (VEC). Since VEC technology is computer based, the result is more consistent boats. Using a computer process to build boats means that a whole new strain of boat builders has come on the scene. Instead of woodworkers and craftsmen, the industry is hiring people with computer skills. With Roplene technology, a single-piece boat is molded out of polyethylene powder. After the boat is removed from the mold, foam is injected between the hull and deck. The Roplene material is extremely buoyant, as is the foam flotation. 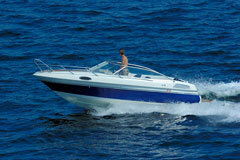 Since the size of the boats is limited by the size of the ovens, this technology is best for smaller boats. 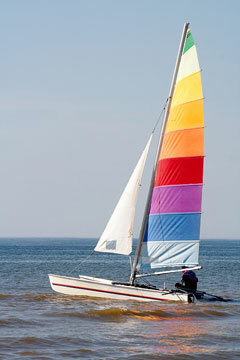 Another process using thermoformed plastic makes boats out of large plastic sheets, which are loaded into an oven and molded. A fiberglass hull is laid down over the finished hull, and foam is injected into the space in between. The result is a composite boat comprising a plastic outer layer, a high-density foam interior, and a fiberglass backing. Another technologically advanced method of building smaller boats uses the patented RAMCAP process, in which the hull and deck are laid up over three premolded foam cores in hull, deck, and transom shape. When the pieces are complete, the boat is vacuum-bagged. The amazing thing about this system is that the one-piece hulls are built — from start to finish — in about 35 minutes. While the Unibond method of building boats has been used to build Boston Whalers for 50 years, it's still considered state-of-the-art. In this process, liquid foam is injected between the fiberglass hull and deck before the resin sets up, which allows it to chemically bond the foam and glass as they cure. Finally, in addition to closed molding and plastics, some manufacturers are using stretchable aluminum to create curved hulls. In addition to facilitating the manufacturing process and producing what some feel to be better boats, many of the new technologies are also more environmentally friendly than traditional boat building methods. As green boat building becomes more popular, some of these new methods will gain in popularity and overtake traditional methods. VEC technology, for example, reduces production time and pollution. Despite some of these new trends, don't expect traditional open-molded fiberglass hull construction, with foam and fiberglass stringers, to go away just yet. This method has stood the test of time for many years, and is still a relatively fast and easy way to build a smaller boat.